This recipe utilizes very few ingredients to make the flavor of the peaches shine through. 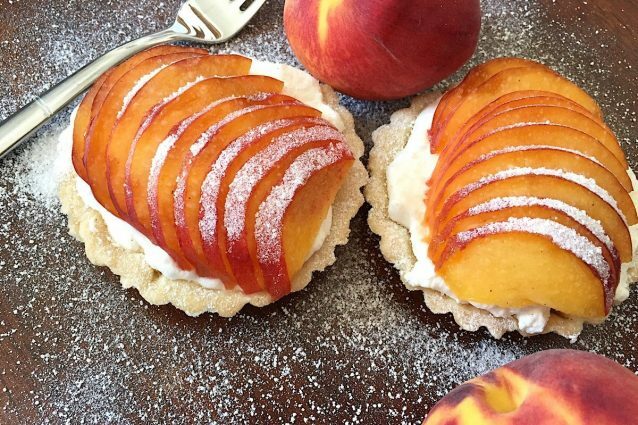 These tartlets are a perfect summer dessert, when peaches are nice and fresh, as it is served cold. A homemade tart dough is pressed into individual tart pans and baked. 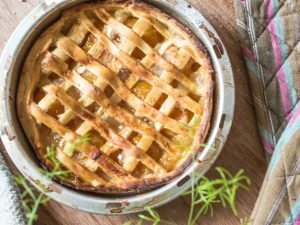 A whipped mascarpone cream fills the tart shell and freshly sliced peaches garnish the top. Simple, straight forward and absolutely delicious, you will want to make these tartlets again and again. In the bowl of a stand mixer fitted with a paddle attachment, make the tart dough by mixing the flour, salt and butter until small crumbles form. Wrap the tart dough and refrigerate for at least an hour to make the dough nice and firm. Place the tart dough into your individual tartlets shells and press into the sides of the pan. Bake in a 350 ̊F oven for about 30 minutes or until the tartlet shells begin to turn golden brown. Remove from the oven and allow to cool. In a stand mixer, whisk together all of the ingredients for the mascarpone cream. Whisk until the cream is thick and stiff peaks form easily. Scoop the mascarpone cream into the tartlet shells. Thinly slice the peaches, keeping them in a nice, pretty row. Place the peaches on top of the tartlet and serve immediately or store in the fridge for up to 5 hours. -This recipe is also delicious with pears rather than peaches. Berries are a great fruit to use as well at the beginning of the summer when they are fresh. – Make the tartlet shells ahead of time and store in an airtight container for up to a week. -If you would like to make one large tart, that is definitely possible using this recipe! Skip the mini tartlet pans and opt for a large 9″ round tart pan instead. Follow all the same steps!